The same technology that has been used by the Navy for communication: sonar, could be used to treat heart failure, diabetes or other illnesses. 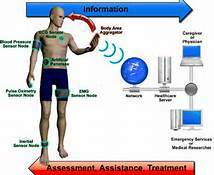 University at Buffalo, a leading research center is working on the ability to use this technology for medical diagnosis and transmitting information. The advancement relies on sensors that use ultrasound. Ultrasound has been used by military submarines and in medical offices. Similar to how the navy subs communicate between each other, medical devices such as a pacemaker could communicate and transmit pertinent data by radio waves. Exploration in this area has been in development for over 10 years. However, the focus was on electromagnetic radio frequency waves, similar to ones in GPS units or cell phones. Drawbacks of electromagnetic radio frequency waves include the amount of heat produced and energy that is needed. Since the body is made mostly of water, over 65 percent, electromagnetic waves do not easily propagate. This research focuses on ultrasonic networking through body sensors through a closed-loop combination of mathematical modeling, simulation, and experimental evaluation. “This is a biomedical advancement that could revolutionize the way we care for people suffering from the major diseases of our time,” said Tommaso Melodia, PhD, UB associate professor of electrical engineering. Dr. Melodia is supported by a National Science Foundation (NSF) CAREER grant for his research, “Towards Ultrasonic Networking for Implantable Biomedical Device,” The NSF Career grant is considered a highly respected award and will last 5 years. “We are really just scratching the surface of what’s possible. There are countless potential applications,” he said. Design the first existing reconfigurable testbed for experimental evaluation of ultrasonic networks. The project will also create a scholar program in ultrasonic networking and its applications; a new graduate/undergraduate course on acoustic/ultrasonic networking; and broadening technology work in this field. Melodia is a member of the Signals, Communications and Networking Research Group in UB’s Department of Electrical Engineering in the School of Engineering and Applied Sciences. The group conducts research and development in wireless communications and networking, cognitive radios, extreme environment communications, secure communications, data hiding, information theory and coding, adaptive signal processing, compressed sensing,multimedia systems, magnetic resonance imaging and radar systems. To read more about Dr. Melodia’s research project . Stay tuned here for the latest development in this new technology!